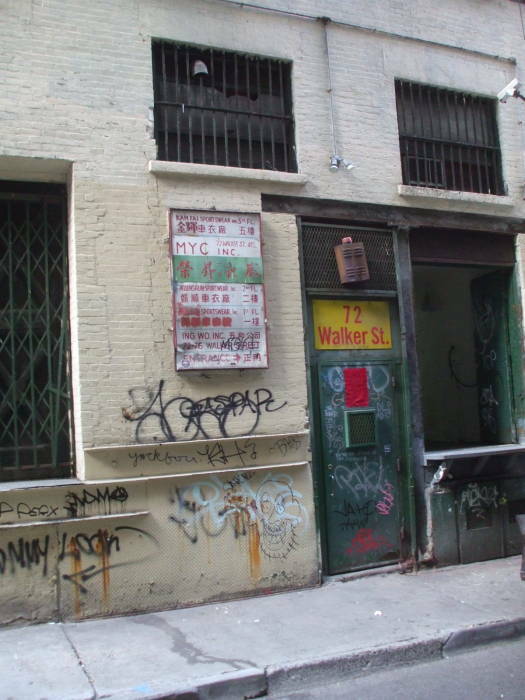 The iconic late 1970s nightclub The Mudd Club is in the Tribeca area of Manhattan, at the south end of Cortlandt Alley south of Chinatown. 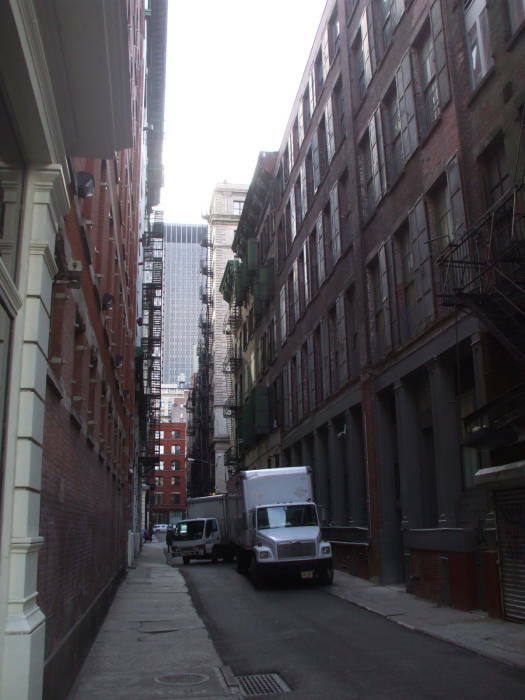 Cortlandt Alley runs south from Canal Street to end at White Street. 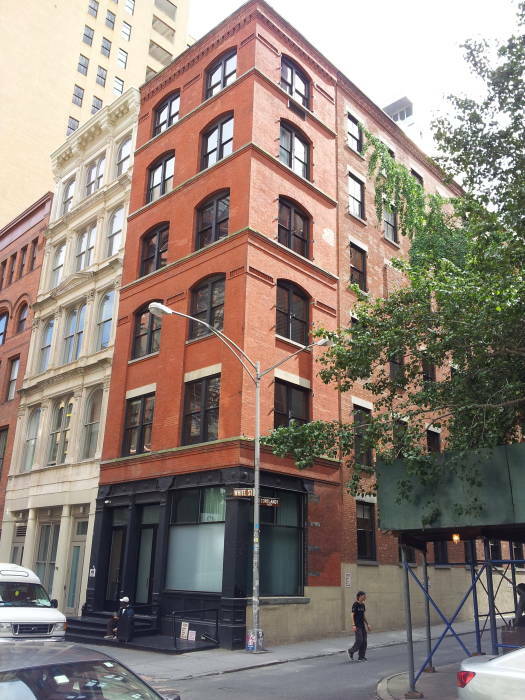 On one corner at the south end is #77 White Street. It's the six-story brick building visible at the end of the alley in the long view. The structure was built in 1888 for the real estate developer John Dodd. 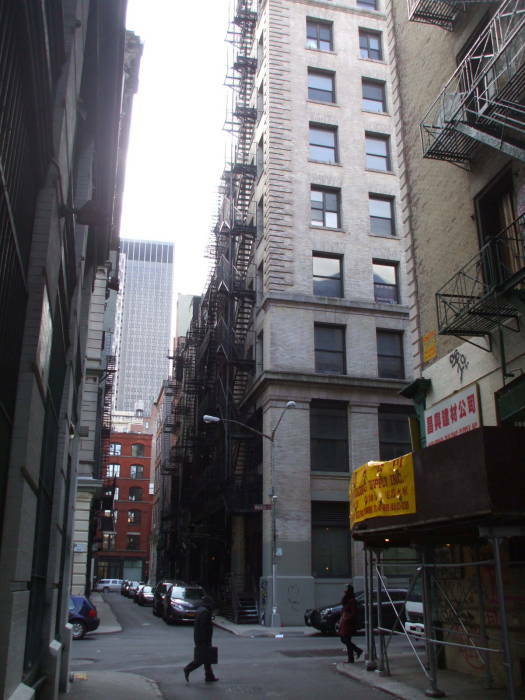 Much more recently it was the site of The Mudd Club from 1978 to 1983. The Mudd Club was named for Dr. Samuel Alexander Mudd, who treated John Wilkes Booth after he injured himself while assassinating Abraham Lincoln. Mudd grew up 30 miles southeast of Washington, D.C., on his father's Maryland tobacco plantation worked by 89 slaves. After home schooling until he was fifteen, and two years in boarding school in Frederick, he enrolled at Georgetown University and then studied medicine at the University of Maryland in Baltimore. He returned to southeastern Maryland and opened a medical practice, supplementing his income by growing tobacco. That would have been a lot of work, so Mudd purchased five slaves. Mudd was convinced that slavery was divinely ordained. But the American Civil War began in 1861, and in 1864 Maryland abolished slavery. This greatly inconvenienced Mudd, who considered selling his farm. He was introduced to the actor John Wilkes Booth, who said he might be interested in buying. But this was just a cover for Booth's real plan to scout out an escape route from Washington. Booth shot President Abraham Lincoln on April 14, 1865. He broke his leg jumping from the Presidential box to the stage in Ford's Theater. He and David Herold, a co-conspirator, made their way to Mudd's house, arriving there about 4 AM the following morning. Mudd set Booth's broken leg, and bandaged and splinted it. Booth and Herold slept at Mudds house, staying there twelve to fifteen hours. Booth was killed on April 26th, and Mudd was arrested and charged with conspiracy to assassinate the President. Witnesses at his trial testified that Mudd had shot one of his slaves in the leg, had threatened to send others to Richmond, Virginia to help build Confederate defense works, had been a member of a Confederate communications agency, and had sheltered Confederate soldiers on his plantation. Mudd was found guilty, but escaped the death penalty by one vote. Mudd was shipped off to Fort Jefferson in the Dry Tortugas (about 70 miles west of Key West) to start his life sentence. Two months after his arrival, control of Fort Jefferson was transferred to the 82nd United States Colored Infantry. Mudd, a former slave owner and abuser who was involved in the assassination of Lincoln, concluded that the new unit might not treat him all that nicely and tried to escape by stowing away on a transport ship. He was quickly captured and held in what they called "the dungeon". Mudd's defense attorney was Thomas Ewing, who was influential in the administration of Lincoln's successor Andrew Johnson. He managed to get Johnson to pardon Mudd in February, 1869. This started a long process of Mudd's descendants attempting to get him fully exonerated of any involvement. His grandson pestered several successive Presidents, getting only an explanation from Jimmy Carter that he had no authority under law to set aside the conviction, and a response from Ronald Reagan that he had come to believe that Mudd was innocent. Then there was a House Bill, which failed in committee. Then they went after the U.S. Army on the basis that Mudd should have been tried in a civilian court, but the Acting Assistant Secretary of the Army rejected this. Finally, they took a court case as far as the U.S. Supreme Court, which refused the case in 2003 as the deadline for filing had been missed. News anchor and journalist Roger Mudd is related to Dr Mudd, although he isn't a descendant. Harcourt Fenton "Harry" Mudd, however, very well might be a descendant. The Talking Heads referenced the Mudd Club in their song Life During Wartime. The Ramones mention it in The Return of Jackie and Judy. Nina Hagen mentions it in New York / N.Y. Frank Zappa made fun of it in Mudd Club. The B-52s' first New York concert was at the Mudd Club. The Mudd Club was known for punk and "No Wave" music and was patronized mostly by that crowd in the beginning. Live performances also featured experimental music and readings by Allen Ginsberg and William Burroughs. Lou Reed, Debbie Harry, David Byrne, John-Michel Basquiat and others from the music and art scenes were associated with the club. 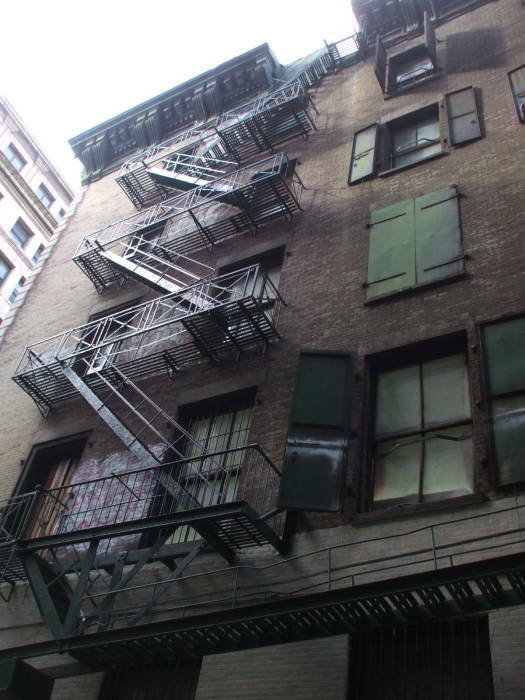 The Mudd Club was meant to be an antidote to the "uptown glitz" associated with places like Studio 54, but after the first year or two "uptown celebrities" like Andy Warhol and David Bowie started frequenting the Mudd Club. 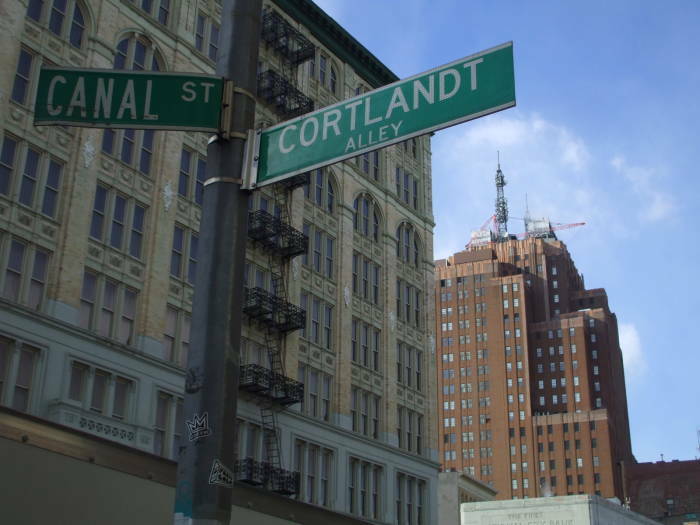 Courtland Alley runs southwest from Canal Street for two blocks, passing through the "i" in "Fire Sta". 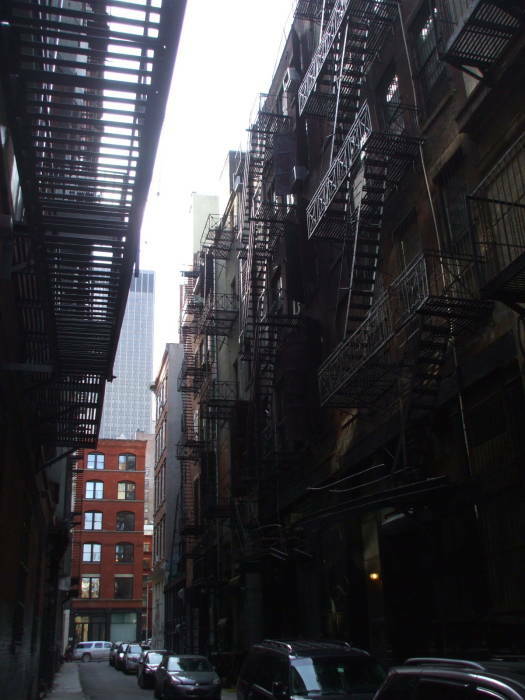 Cortlandt Alley is the only alley in Manhattan. Or at least it's the only remaining roadway still officially designed as an "alley". Starting at the southern end of the island, Lower Manhattan's roadways are based on the livestock paths of the 17-century Dutch settlement of old Nieuw-Amsterdam. The current streets become increasingly orderly as you move north to Houston Street. Then you enter the meticulously laid out grid of the Commissioners' Plan of 1811, which defines a rectangular grid of north-south Avenues and east-west Streets running north from there through the northern tip of Manhattan island. 1st Street joins Houston Street at a very shallow angle at its east end. The east-west streets are numbered from there north. The blocks are quite wide east to west, between the avenues, and narrow north to south, between the streets. Generally speaking, the central avenues are spaced 922 feet (or 281 m) center to center with the outer avenues near the waterfronts a little closer together. First Avenue runs along the east side of the island, along the East River, with Twelfth Avenue on the far west parallel to the Hudson. The streets are about 200 feet (or 61 m) center to center. That plus a typical street width of 60 feet makes it almost exactly 20 blocks per miles going north-south. 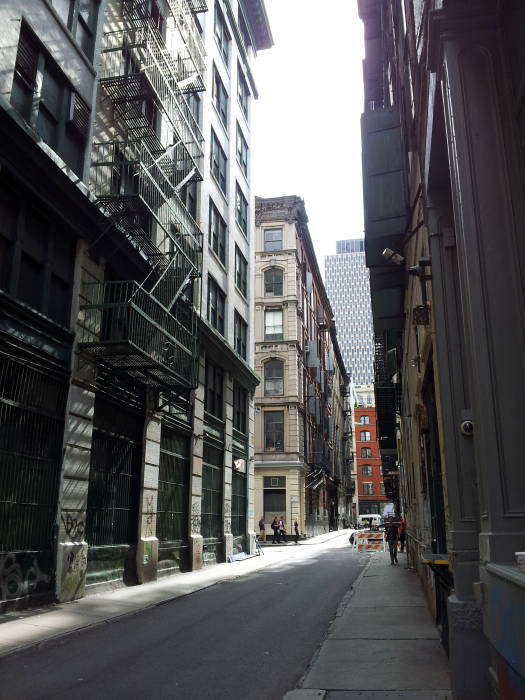 Cortlandt Alley is quite literally in TriBeCa, the Triangle Below Canal Street. The building in the background is the former AT&T Long Lines headquarters, now a major Internet routing node and hosting facility. Originally there was a Fourth Avenue. Now it's Park Avenue. If you're on the Upper East Side you can remember that because it's the one with a park, or at least a planted median, running down its center. Then Madison was inserted between Fifth and Fourth/Park, and Lexington between Fourth/Park and Third. 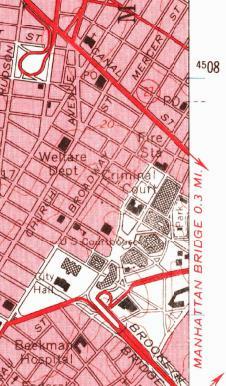 Alphabet City is the bulge into the East River to the east of First Avenue, where Avenues A, B, C and D run north-south. 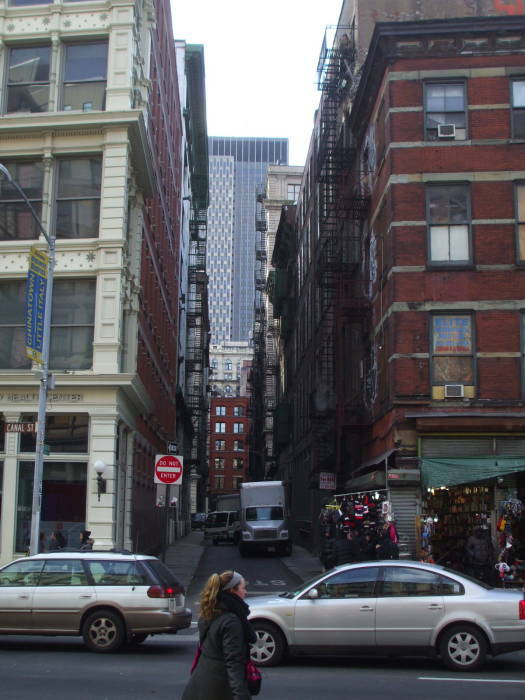 Cortlandt Alley runs north-south between Broadway and Lafayette (that is, a half-block east of Broadway), two blocks south from Canal Street across Walker Street to White Street. 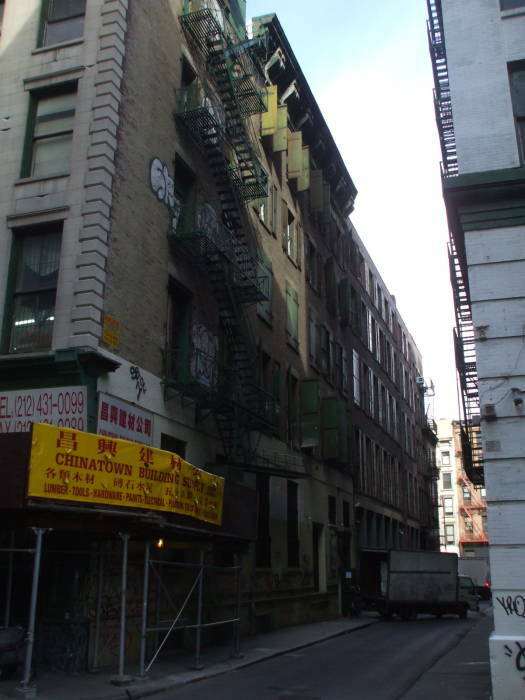 More practically, Cortlandt Alley is just off the south edge of Chinatown, running south from Canal Street. It's named for the Dutch landowner Jacobus Van Cortlandt. Canal Street has a daily frenzy of commerce driven by all the discount stores and sidewalk vendors. On top of that, Canal Street is the connection across Manhattan from the Manhattan Bridge from Brooklyn to the Holland Tunnel to New Jersey. Down in the south half of the alley, between Walker Street and White Street, there's an iron-gated entryway leading down into a wooden staircase. It's the New York Table Tennis Federation Training Center. It's said to be the largest indoor table tennis facility in New York City, with over 6,000 square feet of training area. You can also find Museum, a museum housed in a freight elevator, open 24/7 by appointment. 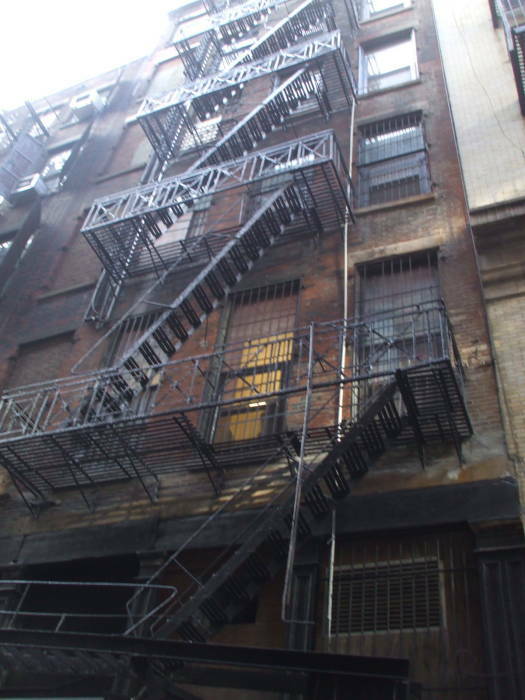 Every screenwriter feels a need for their archetypal New York alleyway, even through there mostly is no such thing. 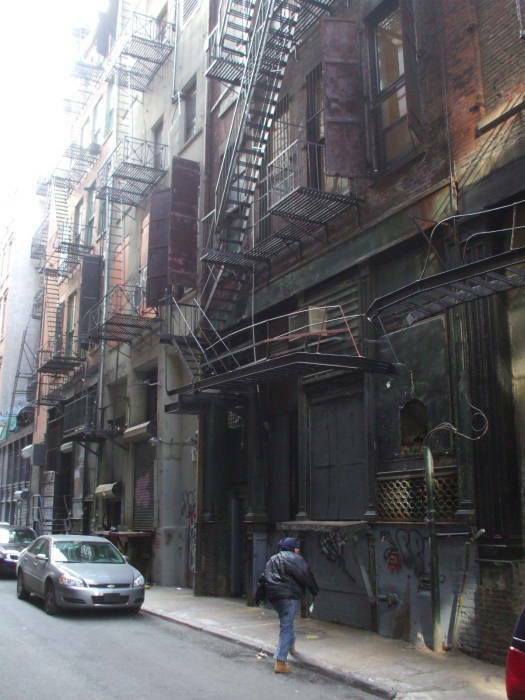 This archetypal setting is dark, narrow, deserted (except for the threatening shadows), with rusting fire escapes, small loading docks and metal doorways, and brick walls covered with graffiti.